Our Sunday afternoon Contra Dance series is family-friendly, features live music, and is held twice a month, with rotating callers. The Sunday sessions are open to children. 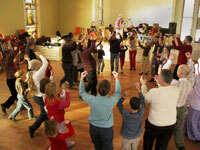 Bring the whole family for a fun-filled afternoon or evening of dancing and music in a friendly, informal atmosphere. No experience necessary. View a Barn Dancing video!